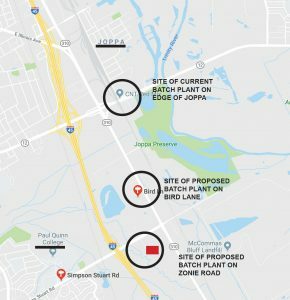 On Thursday the Plan Commission will vote on an SUP for the Bird Lane batch plant site – one of two being proposed by Estrada Concrete along the Stuart-Simpson/Central corridor in South Dallas. 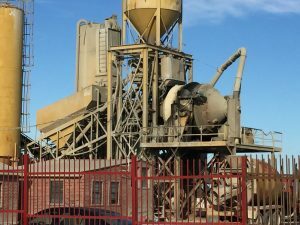 There is more than a little suspicion that this is a backdoor way to get the pair of batch plants that were defeated by Joppa residents in March back in play – only in a more business-friendly council district. The two new requests are coming from a very small company run out of a house with only one batch plant in operation now, located in an industrial park in Hutchins just six minutes down the highway. 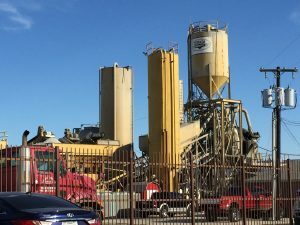 Staff has recommended approval of a Special Use Permit to operate a batch plant for three years at this Bird Lane site, which is next to homes and right around the corner from a second batch plant site the same company – Estrada Concrete – is pursuing via a zoning change request. Since there are two sites there are two votes. The other site won’t come up for a vote until January 3rd at the earliest, but this Bird Lane site is gong through the pipeline now. 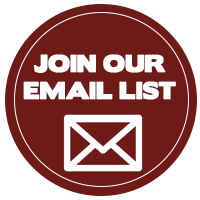 What’s needed now is sending these Plan Commission members lots and lots of emails saying we oppose these zoning changes and Special Use Permits AND are seeking a individual hearing for the Bird Lane site on the 13th. There are two different types of agenda items when it comes to city decisions. One is the “individual” agenda item for which topics will be discussed and the public can make comments. The other type of agenda item is a “consent” agenda item in which case the topic is not discussed and the group simply votes on it with the understanding that most agree with what is being proposed. In this case, the batch plant’s Specific Use Permit (SUP) request has been recommended by staff for approval for a three year period and it is assumed that none of the city plan commissioners oppose the staff recommendation. 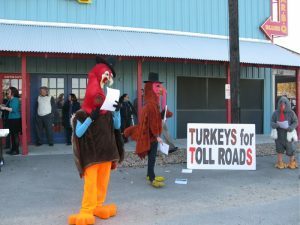 Dallas residents opposing this Bird Lane batch plant should contact their own District’s Plan Commissioner and City Council Member and let them know know you want the Plan Commission to pull the item from the “consent” agenda so it will individually discussed on the 13th as part of the public hearing portion of the agenda instead of the done deal “consent” part. A hearing requires the public to be heard and a recorded vote take place by Plan Commission members for some kind of action – Delay, Disapproval, or Approval. We get to make our case against the batch plant only if it’s pulled off the consent agenda. Folks opposing the zoning change may speak against the staff’s recommendation if they choose. The hearings start at 1:30 PM and can last through the early evening. It’s hard to tell what time the item will be heard, so be prepared to come and stay awhile. 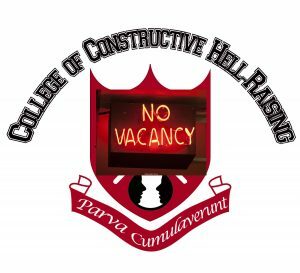 is completely full and the largest ever at 20 students. Circumstances may change however, so we’re creating a stand-by list just in case there are any drops. Let us know if you’re interested thru our downwindersatrisk@gmail.com address. Besides being the most sizable, the class of ’19 looks to be one of our most diverse in terms of background, experience, and interests. 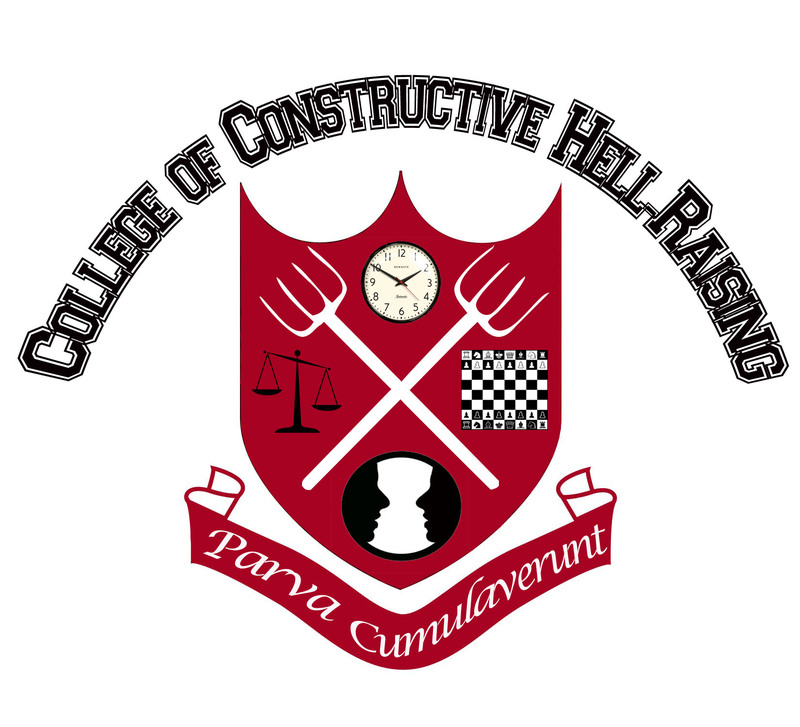 We’re excited to share the semester with them. The question sounds like the lead-in to a joke, but it’s not: How many months does it take Dallas City Hall to respond to a simple Open Record request? Answer: we don’t know yet, we’re still waiting. Back in July, you might remember we reported on the establishment of a regional clean air fund to fight coal plants a decade ago that still had over a half million dollars in it. When we dug a little further, we got a response that the fund had been shut down and the money disbursed – despite the fact nobody could give us the details on how or why that happened, where the money went, and if any of it went to clean air work. So we filed a Texas Open Records Act request to get any and all files on the fund. On July 16th. Governments have 10 days to respond and provide the files that aren’t attorney-client products. We have yet to get the paperwork we asked for from the City. What we have received is one after another email saying the response has been delayed…again. We’re now going on three months awaiting information for a fund that supposedly doesn’t even exist anymore. And this is after the city already received permission from the State Attorney General’s office to withhold certain files from us because they were “attorney product.” What is it about this fund and that half million dollars that the City of Dallas staff really don’t want their own residents to see? Just as ridiculous is the city’s response to an Open Records Act request we filed to look at its files on TAMKO in August. 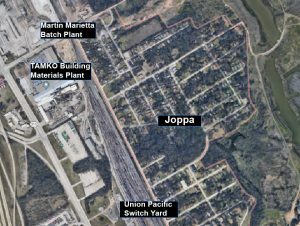 The huge asphalt shingles plant in Joppa had a long sting “upsets” and “accidents” between 2011 and 2015 that released over 7000 pounds of unaccounted for PM pollution. Those are TAMKO’s self-reported numbers and don’t even include fires when there was “100 Opacity” i.e., smoke. We know this because Downwinders was able to access the Texas Commission on Environmental Quality files on TAMKO way back in the summer. We put in the same request to the State that we submitted to the City of Dallas. 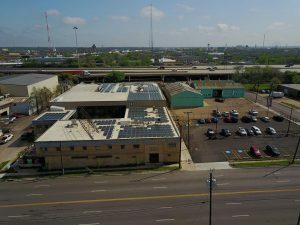 Believe it or not, TCEQ was much more responsive and cooperative than the City of Dallas, who we’re still waiting on to release their files on the plant. Two months and counting and still no substantive response. Shouldn’t a resident be able to make an appointment, go down to City Hall and look at the public files on a well-known polluter? So far, the City of Dallas says no. 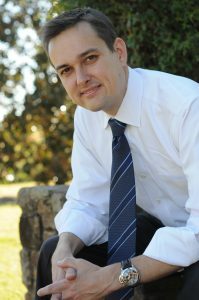 Dallas City Hall has a notorious reputation for mishandling, losing, or otherwise being non-responsive to Open Records requests. 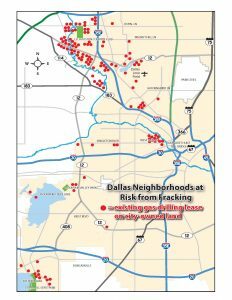 They aren’t know as “citizen-friendly.” But these two cases seem extreme because the delay is all out of proportion to the files being requested – for a fund that was shut down and a polluter in South Dallas. It certainly appears that staff is going out of its way not to hand over anything of import, no matter if its attorney work product or not. One can only guess why that is. Only in the nonsensical world of EPA air quality regulation could the official regional average for DFW smog actually decrease despite the worst levels of DFW Ozone pollution in five years. 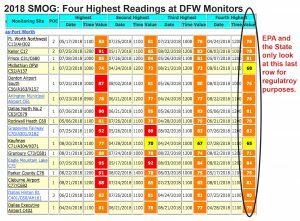 In 2018 a quarter of all North Texas official monitor sites recorded smog levels in the 90-95 ppb range for more than an hour. 2018 was the first time in two years that any DFW monitors have had 8-hour averages of 80 ppb or above, and the first time since 2013 since there been at least six. In fact, this year’s total number of 80-or-above monitors is almost equal to the total number from the last five years combined. Nevertheless, the regional average for smog pollution that determines government action actually went down from 81 to 76 parts per billion. How does that happen? Not without a lot of numerical manipulation. EPA’s formula for smog pollution classification is a two part affair. 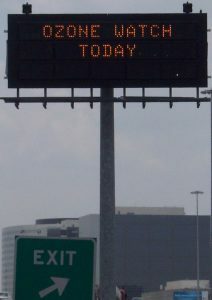 First EPA only counts the highest 4th highest annual reading from each monitor in DFW. That means every monitor gets three “Mulligans” or “do-overs” before the results are eligible for regulatory use. Then EPA combines the last three year’s worth of those highest 4th highest readings to produce a rolling average. So that 2018 average is actually the results of the highest 4th highest reading from 2016, 2017, and 2018. High readings from the summer of 2015 are rolling out of that three-year rolling average, while lower readings in ’16 and ’17 remain. While this year’s smog levels were higher, but not so extraordinarily high as to be able to counter the lower numbers making up the rest of the average. But our smog was bad enough last year and this to once again make sure DFW is in “non-attainment” of the clean Air Act for the pollutant. For the umpteenth time in a row, we missed a deadline for meeting a Clean Air Act smog standard – this time it’s the 2008 75 ppb standard. If EPA follows its own protocol, that means DFW will be go from being “moderately” out of compliance to being in “Serious” non-compliance. 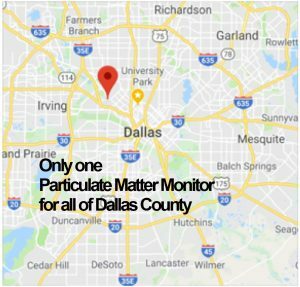 And please remember all of these numbers are based on only 20 smog monitors, half of which are located well-outside the DFW urban core, and none of which are located in Wise County, where Downwinders is doing the job of monitoring ozone pollution that the State and EPA refuse to do. 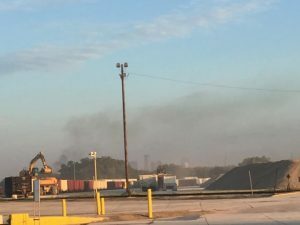 What are the consequences of this continuing violation of the Clean Air Act that imperils public health? Nada probably. At least while the Trump Administration holds office. In the past such classifications would have triggered a process leading up to some kind of official plan of action that, at least rhetorically, is aimed at correcting the 30-year old problem. But no one expects the State of Texas, or now the EPA, to take that responsibility seriously. What you can expect is some official TCEQ spin about how it’s been successful in bringing down smog pollution levels. In fact, it was the wettest September on record that brought an abrupt end to what was shaping up to be an even worse smog year than it already was at the end of August. Historically, September is when DFW sees some of its worst bad air days. But not this year. 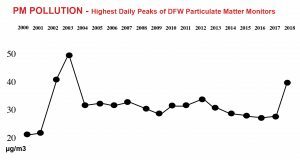 Accompanying the rise in smog pollution in 2018 was also a dramatic rise in the regional numbers for Particulate Matter (PM) pollution – the highest North Texas has seen since 2003. Before this year, they’d only been four daily peaks above 40 µg/m3 over the last 15 years. In 2018 four out of 6 PM monitoring sties had registered daily readings averaging between 41 an 43 ppb as of October. 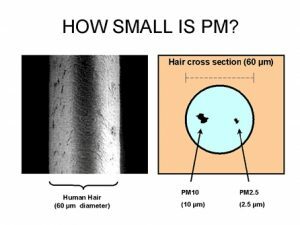 The EPA annual standard for PM pollution is 12 µg/m3. The 24 hour standard is 35 µg/m3. As with smog, these readings are coming from a very small pool of monitors – in this case just six PM monitors scattered over an area only slightly smaller than Rhode Island. Some of this might be blamed on the drought we we experiencing during the summer and increased dust circulation, but comparing it to 2011 when similar if not worse conditions were in play shows no similar bump then. Fewer coal plants blowing their plumes into DFW this year might lead you to think we were even due for a drop. Instead it’s as if someone turned the key on a couple more. There’s no obvious reason why PM levels would have jumped so much in a single year. 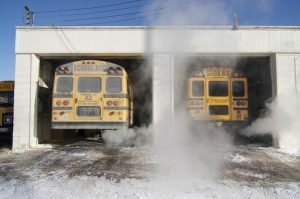 What’s clear is that local governments are the last refuge for effective and new air pollution control measures. Until political leadership changes in Austin and/or Washington, there’s no expectation of any relief. In fact, every day sees new proposals from the State or EPA that will actually increase smog and PM pollution in DFW. This is why local city and county elections are just as important as state and national ones. We’ll have to wait until the end of 2019 to see if this rise in pollution averages is a trend or blip, but there’s no question that smog and PM are taking their toll on public health in DFW. Study after study shows harms at levels of exposure well below these annual and daily averages that determine EPA regulations. In the real world, your lungs, heart, brain and immune system don’t seem to be able to distinguish between “safe” and “unsafe” levels of poison as defined by the government. 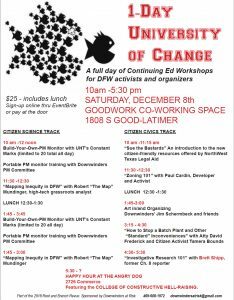 Every year Downwinders at Risk takes a week off and sponsors a floating conference aimed at making North Texas organizers and activists better advocates. This year’s Root and Branch Revue is again packed with star power and covers new ground. Here’s your first preview of what’s being offered. Mark you calendars now. These events are for people exactly like you. 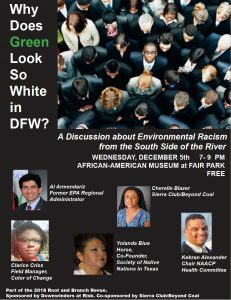 Why Does Green Look So White in DFW? 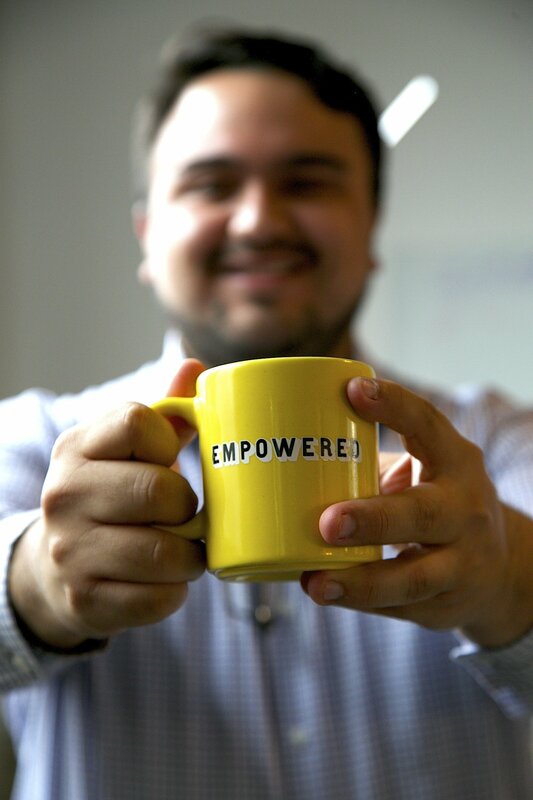 $25 Includes lunch and all these workshops…. 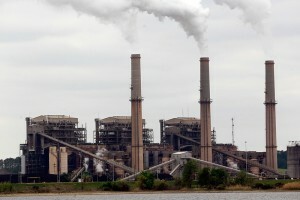 Downwinders is proud to announce that our precedent-setting use of portable PM monitors to help Joppa residents defeat two proposed batch plants earlier this year was selected by manufacturer Aeroqual as a case study showing how its new air pollution technology has made a positive difference in the world. Joppa will join other examples from places like Tanzania, Iraq, India, and Peru on the Aeroqual website. It will be the only success story attributable to a citizens group as opposed to a government agency, university, or business. “Timing is everything” is a cliche but in this case the banality is on point. 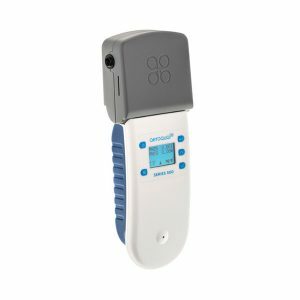 Aeroqual’s new 500 series hand held portable PM monitors had only become available in January of this year, at exactly the time Downwinders was looking for a device that was highly reliable but not prohibitively expensive. 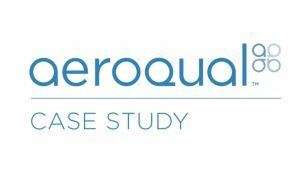 In offering the 500, New Zealand-based Aeroqual carved its own market niche and met our criteria like a glove – more reliable than the extremely cheap consumer sensors you can buy on Amazon and less expensive than similarly calibrated machines affordable only to universities, industry and government. Because they were so new, we had to call Aeroqual in New Zealand to order them directly. We were their first US customers. Downwinders ordered two for deployment in our PM Pollution Prevention campaign. When they arrived in late February, they were the only ones being used between New Zealand and the US. 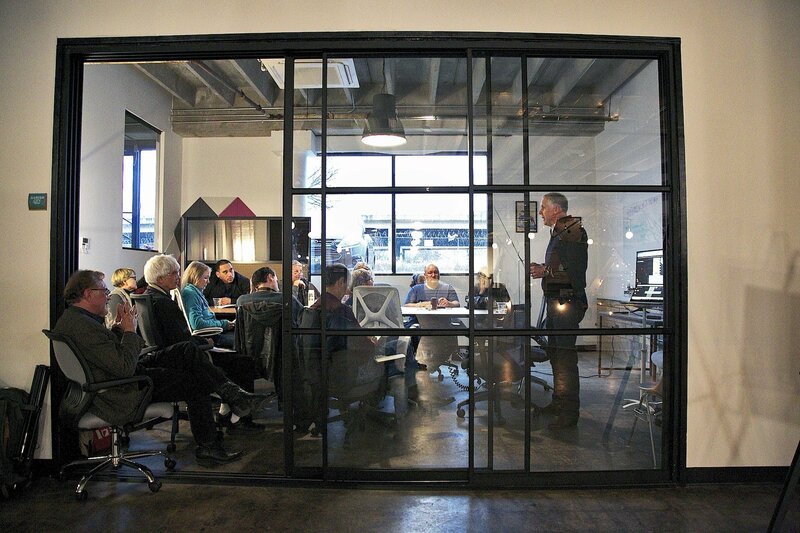 Since then, the company has made huge inroads into the US market, to the point of partnering with the EPA in Los Angles to establish a 100-monitor air network for Particulate Matter and smog pollution, and being considered for the monitor in the City of Dallas/Texas Nature Conservancy Breathe Easy study. 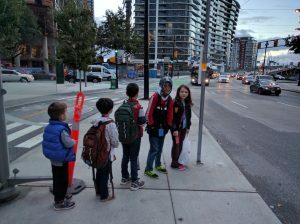 Downwinders’ original plan was to use the monitors to document PM levels along DART routes as research for our Green Streets bus electrification effort and set out for a couple of weeks doing nothing but measuring levels of PM inside and outside of buses. We were still doing that when we got a call from the Joppa Freedman’s Township Association to request we turn our attention to their fight over two new batch plants. 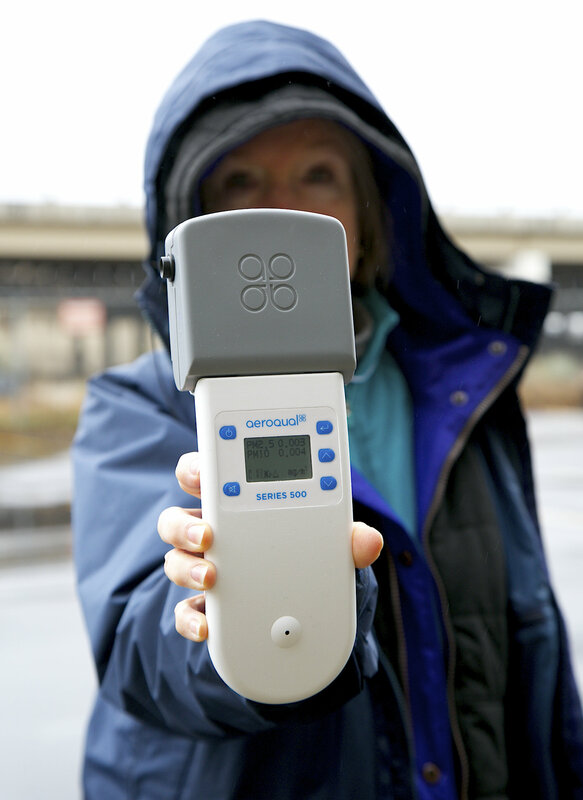 Aeroqual’s portable machines provided the first, and so far only, air sampling in Joppa. They recorded significantly higher PM levels than the official EPA site some nine miles away. This was the same EPA site Dallas city staff was using to give Joppa the all-clear. The fact that the Aeroqual monitors came factory-calibrated out of the box and were supervised in their use by a local atmospheric scientist enhanced their credibility. Their results were widely publicized only days before the City Council vote and combined with opposition on the ground, contributed to the council vote against the batch plant permits. It was the first time in local history, and we’re pretty sure in Texas or even the country, that this new technology became a tool for citizens in a successful permitting battle. And that’s why we’re ending up as the first citizens group case study for Aeroqual. This training session is a chance to become familiar with this new technology and work your way toward being able to check out these portable monitors on your own. No previous experience required. No math or engineering degrees necessary. If you can push buttons and read numbers, you can do this. It only takes two hours. Along with first-timers, graduates from our first classes of Apprentice Citizen Scientists are invited back to take a field trip with our PM Committee and step-up to “Researcher” status. After one more outing, they’ll be given permission to check out the monitors for their own purposes or to help with our projects. We’re entering a new era of Do-It-Yourself Environmental Protection. Learn how you can join it. The GreenSource DFW Leadership Awards are one of the only ways, and certainly the most popular way, the DFW environmental community recognizes accomplishments among its own ranks. They’re now in their seventh year and the end-of-the-year awards dinner where the winners are announced is the rare Big Tent event on the local green calendar. 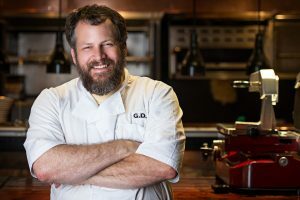 There’s a nomination process, followed by a selection committee within Green Source staff, and then they open up the list of final nominees to a popular vote of sorts. We’re in the voting period now. And in this election, you can vote every 24 hours during the two-week voting period, ending September 30th. So you really can vote early and often…legally. 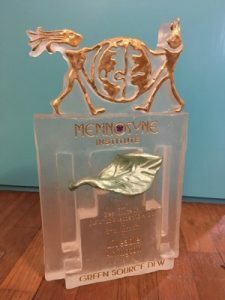 There are awards for green-writing journalists, green groups and green people, er activists. This year we’re lucky to have direct ties to three nominees and we hope you do vote for them often over the next three days. 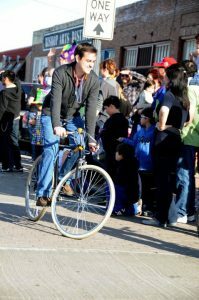 Downwinders board member Eveyln Mayo is nominated for the Coke Buchanan Volunteer of the Year Award. This award goes to a person showing outstanding volunteer service to a green cause or organization. “At 23, Evelyn Mayo may be one of the youngest environmental organizers in DFW, but she has the bearing of a veteran eco-warrior. 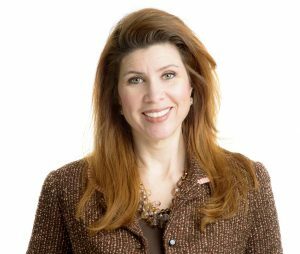 Arriving in DFW fresh out of college only 14 months ago, she joined the board of Downwinders at Risk and has helped revitalize that group by leading it into new areas of program work and attracting a team of inspiring 20 and 30-something women to join her. 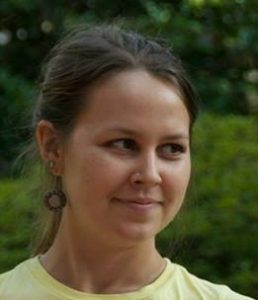 Evelyn has been the Chair of Downwinders’ Particulate Matter Campaign Committee since its creation last Fall. In that role, she’s helped raise the profile of a long-ignored pollutant. She initiated and helped host community meetings on the dangers of PM. She’s a liaison between Downwinders and the North Texas Transit Riders to help better protect a population that’s routinely exposed to high levels of PM pollution. 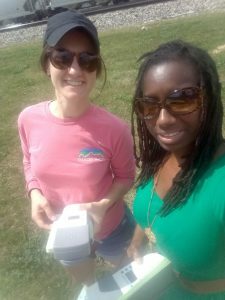 She coordinated the deployment of Downwinders’ portable PM monitors in the Joppa neighborhood that revealed high levels of PM there when City staff was trying to reassure residents with the readings of an EPA monitor nine miles away. 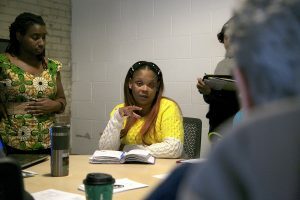 Now she’s helping to assemble a “Justice for Joppa” support committee that can assist the neighborhood in addressing a long list of grievance and needed reforms. 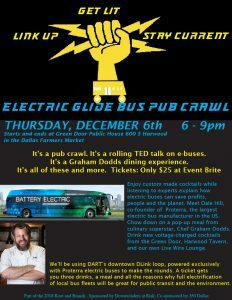 And if that weren’t enough, she’s also helping direct Downwinders’ “Green Streets” bus electrification campaign. It was the portable air monitoring Evelyn coordinated on behalf of the Joppa community that sealed the fate of the two batch plants seeking permits to set-up shop there. Anyone attending the City Council meting in March when the plant permits were debated heard constant references to the dangers of PM – even by batch plant lobbyists themselves. That was Evelyn’s work. 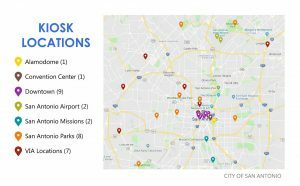 That citizen monitoring project has also given new impetus to the city of Dallas joining a regional air quality monitoring network, which would be about the most important local air quality development in a long while. And that’s why we want you to vote for Evy. 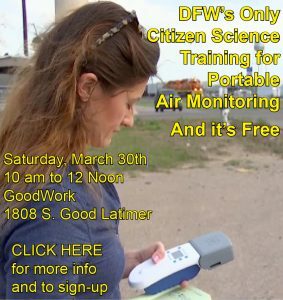 Downwinders and its partners in the DFW Air Research Consortium are nominated for the Environmental Science and Innovation Award for building the North Texas Clean Air Network – the first local, independent regional air monitoring network in the state. The organization of ARC itself is a model for collaboration among scientists, citizen groups, and local officials to harness technology for the public health. It’s been a very effective organization in a relatively short amount of time. 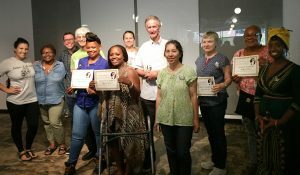 What’s been really interesting to watch since we moved here in February is how many South Dallas entrepreneurs, non-profits and freelancers have found a home where they feel comfortable, forming networks and communities that weren’t available to them before because nothing like GoodWork was around to provide it. 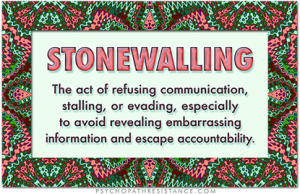 Many of them are grassroots disruptors of the status quo in their own areas of expertise just as Downwindes tries to be in air quality and social justice. 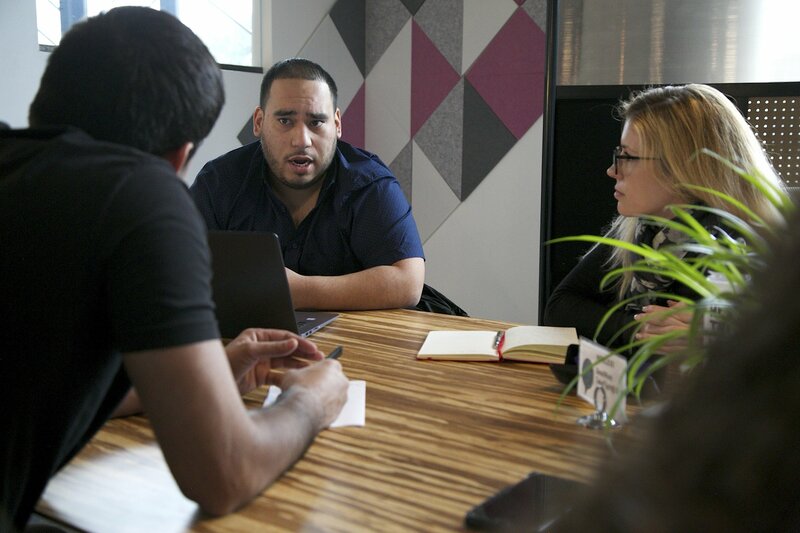 You won’t meet your typical co-worker type and that suits us fine because we’re not your typical environmental group. We wish all the nominees luck, but these three maybe more so. See you at the awards dinner. 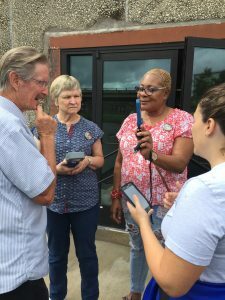 In the middle of the wettest day in the wettest September DFW had ever recorded, the clouds parted and a dozen brave and curious souls turned out to go through the region’s first citizen science training for portable air monitoring. Some were already clean air activists. Some were technology geeks. Some were people simply interested in having the ability to tell what’s in the air they’re breathing. 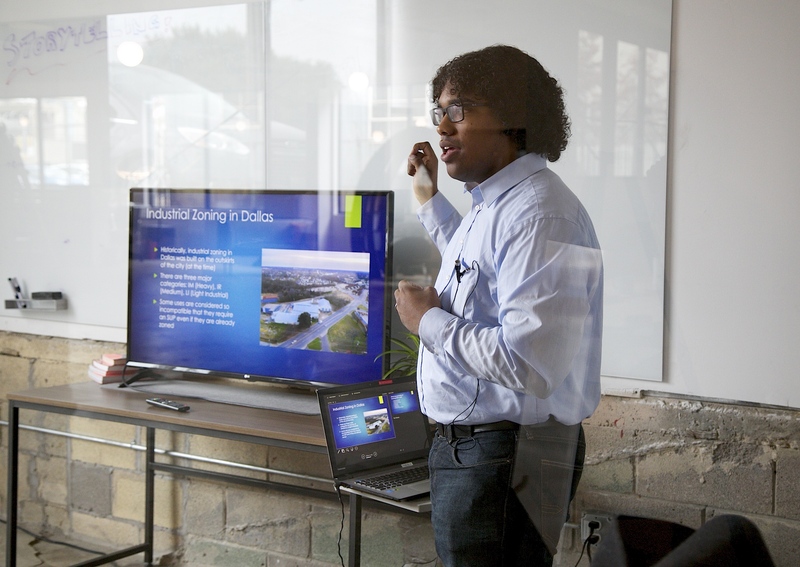 When they showed up to our GoodWork headquarters they got a tag team education on Particulate Matter pollution courtesy of a curriculum designed and presented by Downwinders board members and scientists. 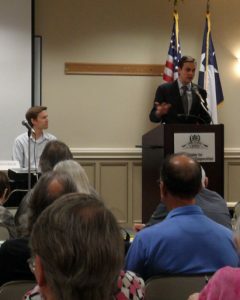 The information set-off lively discussions among residents of Joppa and West Dallas where PM problems are common. For others, the facts brought new awareness about this under-publicized but insidious pollutant. But no doubt many thought the real fun started with the hands-on field training using Downwinders’ three Aeroqual 500 Portable PM monitors. Despite the forecast, there was actually no rain during either the morning or afternoon session and the future scientists got to go explore inside and out. They recorded the dust explosion set off by simply sweeping the floor with a broom. They saw how a lit match changed the composition of the air in a room. They stood downwind from fog machines that were faux-smokestacks for the day and they measured the ambient air in Sunny South Dallas on Good-Latimer. They learned how to sync meteorological tools with the monitors and record the necessary information to make a sampling more useful. They asked questions, they got in arguments and at the end of it all, they got certified as an official Citizen Science Apprentices. They’ll now be able to go out with our PM team for supervised research runs and after two of those they’ll be able to check out monitors on their own through our monitor lending library. Our PM Committee is already looking to host another training session on a weekend in late October and these will be reoccurring on a regular basis from here on out. Be the first one on your block. 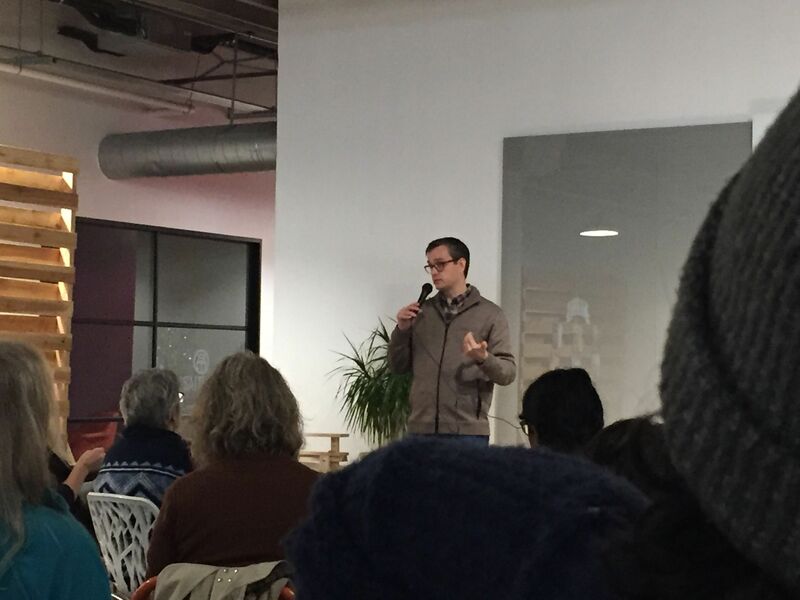 Council Member Kevin Felder welcomes participants to the Let Joppa Breathe meeting at GoodWork last Monday night. 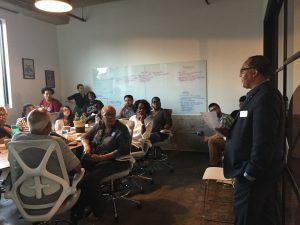 Approximately 20 representatives from advocacy groups, non-profits, and neighborhoods gathered last Monday evening at GoodWork for the very first meeting of the “Let Joppa Breathe Alliance.” It was the first step in organizing a city wide effort to reverse over a century of racist zoning and land use planning in Dallas’ oldest Freedman’s community. Besides Downwinders, there were members of Joppa Freeman’s Township Assocition, the South Central Civic League, the Inclusive Communities Project, Paul Quinn College, the NAACP, North West Texas Legal Aid, and Mia Carmen Theater company. As impressive as the breadth of support was, it was also the first time in memory that whites constituted a tiny fraction of attendance at a citywide Dallas environmental strategy meeting. Rage Almighty, the spoken word artist who MC’d the May 22nd Joppa benefit was back to facilitate. District 7 Council Member Kevin Felder was also back to welcome participants and encourage the building of the broadest possible coalition to win victories. On the agenda were updates from the community, including photographic evidence presented by JFTA’s Temeckia Derrough of continued dust and diesel pollution problems from the existing Martin Marietta batch plant operation. There are continuing rumors about the company coming back to request a second chance at permitting the two proposed batch plants that were denied by the city council in March. There was also discussion about how the group can estimate the emissions from all the short-haul diesel locomotives going back and forth in the Union Pacific switch yard that runs the length of the entire community. Usually the engines that end up in a switch yard are already old and in need of maintenance – yard duty is seen a step away from retiring the locomotive. Their exhaust contains a very toxic form of PM called Carbon Black that’s more carcinogenic than your average PM pollution. Electrification of these locomotives would eliminate a significant source of PM pollution in Joppa. Misti O’Quinn with Downwinders reported that the group and UTD were very close to reaching a deal to place the first air monitor in Joppa, with a location to be announced soon. Another ten have been ordered and will probably be ready to be installed by November. The search is on for locations, with emphasis on getting front line readings close to batch plant, switch yard and the TAMKO shingles plant. 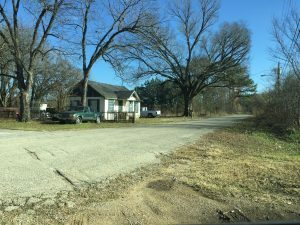 Plans are in the works to have a neighborhood enforcement workshop that includes the staff from City of Dallas Office of Environmental Quality, North West Texas Legal Aid attorneys and others advising residents how to be more effective in making complaints that can stick and lead to changes. Tentative scheduling has it penciled in for a date in later October or early November. 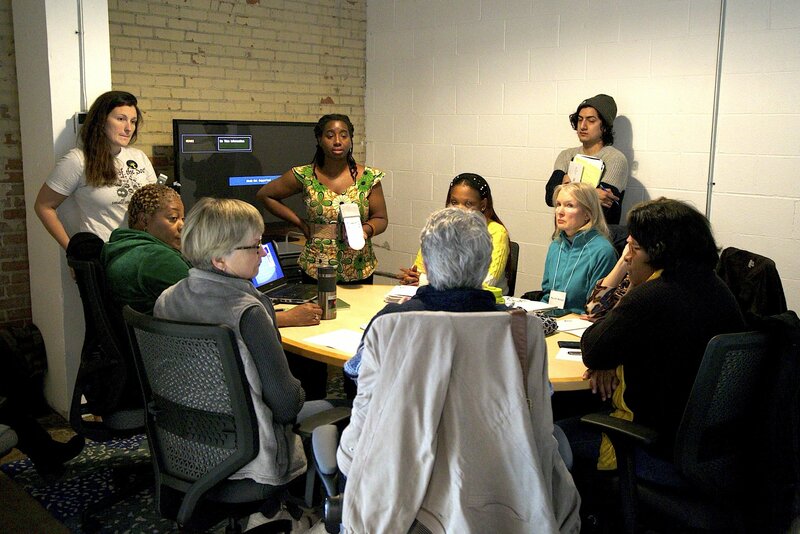 Participants scheduled the next Let Joppa Breathe Alliance meeting for 6 to 8 pm on Tuesday, October 23rd at GoodWork Co-Working space, 1808 S. Good Latimer. All groups are invited to send a representative. This isn’t just an environmental issue. It’s a civil rights issue. The more groups we represent, the faster we can get needed change.